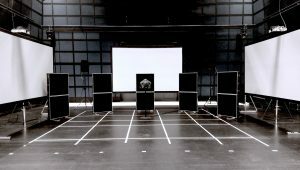 As part of research for an upcoming essay, sound engineer Dr. Franz Zotter allowed me to interview him on some basic aspects of spatial audio, psychoacoustics and the IKO speaker. Dr. Franz Zotter is an acclaimed sound engineer at the Institute of Electronic Music and Acoustics (IEM) of the University of Music and Performing Arts of Graz. His PhD thesis titled “Analysis and synthesis of sound-radiation with spherical arrays” (2009) led to the development of the IKO speaker, which was further studied in the 3-year artistic research project OSIL (FWF PEEK) including sound engineers and composer Gerriet K. Sharma, also in collaboration with Sonible which further developed the IKO to a commercial product. The interview took place at IEM on 11.12.2018.